“Aligned Values” is one of those expressions that can sound academic and hard to define. That’s why we’re sharing with our Casa-Pueblito community and the wider world the real-life, real impact of the support that Meridian Credit Union, Roncesvalles location gives through our BAM art exhibition for emerging artists with Latin American heritage”. First, let’s clarify that our organization isn’t a client of Meridian. With our account and bank card from a different credit union, we simply use Meridian’s bank machine because in Toronto there are tons of bank machines available in this shared credit union network. So, in making this partnership we got to meet Meridian face-to-face. It’s been a great experience to discuss our goals, deadlines, concerns, needs and more with the team at their Roncesvalles Ave. branch and feel the refreshing, upbeat energy among clients and staff alike. The #BAM2018 Exhibition this Sept 16 – 22 (click here for more!) is the community project Meridian chose to support because above and beyond the financial support to make this project happen, this is an opportunity for Meridian to make a positive difference for people in the creative industry. Meridian understands and cares how financial literacy makes the difference between making a living, and making a good living. Many young artists, like those that will be showcasing in the BAM Exhibition, are on a path toward a self- employed, run-your-biz career. Financial literacy is what can make that career long and fulfilling with a great quality of life. Meridian Volunteers Michaela and Brittany (at left) helping at a Casa – Pueblito community event with our volunteer Tatiana: Always nice to spend time with. Creatives can get real-world tools and advice that can propel them to a greater level of financial stability (read: less financial stress and more money) - now and in their future - with the three financial literacy workshops Meridian will host at their Roncesvalles branch. How to set up E.I. for self-employed people? What materials/supplies can an artist write off in their taxes – and, how to do these taxes? And much more. Meridian’s Senior Small Business Advisor, and Tax Expert, and many other staff excited to have fun “talking shop” conversations, will be happy to give advice with an open and creative mindset for BAM artists that want to attend and others in the creative industry for remaining available spots. People, if anyone can make a drinks ‘n greet with a tax expert interesting and fun, it’s Meridian with their after- hours (6pm -8pm) office-party flair at these workshops. There will be piñatas. For Meridian staff these are some of the most interesting and creative chances they got to “talk shop”, without worrying about generating new business. In this case, they’re generating huge impact for Creatives and a wonderful community spirit. Meridian staff can’t make it to the BAM Opening Reception on Sept 16. They’ve already committed their staff to support a community festival on the same day. The extent of their commitment to communities is truly impressive. However, they are also invited to join us at the September 20 BAM Performance & Party night and we will enjoy simply socializing without financial worries for the night! A final note to say, Meridian’s two-year commitment to BAM is what really put the wind in our sails. As financial advisors, they understand how this long-term investment – believe in us now, and what we’re building for the next level – has huge, immediate impact for how we can plan BAM 2019 and engage more supporters, sooner. Thank you, Meridian! Casa – Pueblito began its work in 1992 with the understanding that “now, more than ever” the Nicaraguan people needed our solidarity. As the current civil unrest continues, that urgency has returned to our work. This year we have committed to seven projects that respond to needs defined by communities in Nicaragua for necessities such as drinkable water, food security and education. We remain committed to our vision of compassion and social justice across borders. Our partner communities still have necessities and dreams for the future, and we will work with them to make these a reality. We are a solidarity-based organization and our vision of solidarity includes our staff members. In Managua, our office remains open and with adjustments for the safety and well-being of our staff, we continue with our work as best we can. We have remained open in Nicaragua for the past 26 years through moments of upheaval, and our commitment to the work here includes supporting the livelihood of our staff members as well. In Toronto, our team of part-time staff, volunteers and interns continue to build awareness and engage communities to support the vital work we do in Nicaragua. These annual activities include our Film Night featuring a documentary that addresses key issues; our BAM Exhibition for emerging artists with Latin American heritage; and our Brunch & Auction event that welcomes long-time contributors, former Delegates, and new supporters. We’re in communication with our partners to assess their needs in these difficult times. In response to the locally-defined needs our grassroots partners have expressed as their communities are impacted by civil unrest, we have established a Response Fund to enable our organization to respond to their needs in the short-term in addition to their long-term needs with our community development projects. To learn more about ways in which you can support our organization, click here. Despite the situation, project work is continuing. Our community partners are still working towards completing their 2018 development projects, including wells, latrines, and educational projects for children and youth all over the country. We believe in the strength of our partnerships and are working to support our community partners as best we can. We continue to look forward to 2019 and the ways we can better support communities as the situation continues. Stephanie is a York University student dedicated to global issues and social justice. When she contacted Casa - Pueblito to be a volunteer we knew right away that someone special had arrived in our midst, at a pivotal time for our organization. 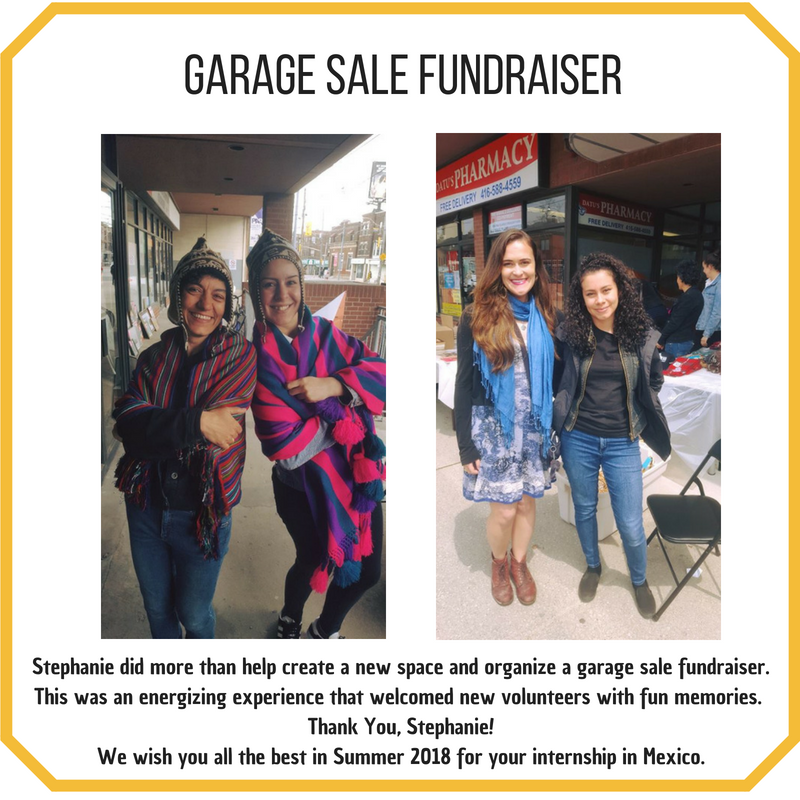 With Stephanie's leadership we embarked on an "Open Closets" project to: 1) Do a massive clean up and re-arrangement of our office; 2) Find Casa Treasures in our closets from our members from around the world; and 3) sell these treasures at our garage sale fundraiser. Stephanie decided to dedicate the funds we raised to the emerging Latinx artists that will be exhibiting their work in our BAM exhibition this September (stay tuned!). In addition to transforming our Casa - Pueblito world to welcome new staff and volunteers in a new, energized space, Stephanie created an opportunity for more volunteers and staff to get involved in this project. We had fun along the way! Stephanie is on the road to transform the world with her care and authenticity to address issues that are critical to Latin Americans. Her next step is her internship in Mexico City. With our best wishes for a great summer, we're sharing Our Story About Stephanie Photo Album. Enjoy! Casa - Pueblito is a solidarity-based non-profit organization. Often, when we’re giving a workshop at a school or explaining our work to a new community member, we’ll get questions about what that means. Today, we decided to break it down! "I don’t believe in charity. I believe in solidarity. Charity is so vertical. It goes from the top to the bottom. Solidarity is horizontal. You may have seen this famous quote by Eduadro Galeano before. It captures why we believe it’s important to work from a place of solidarity. Solidarity means working alongside other people. It means we listen to our community partners and respect the knowledge and expertise they have, ensuring they design and implement our community development programming, rather than prescribing projects to them. Working from a solidarity based perspective means we ask WHY our community partners are facing obstacles like structural poverty and food insecurity. It means that we look to history and contemporary social, political, and economic systems like neoliberalism for explanations. Thus, we not only better understand pressing community issues, allowing us to address them more efficiently, but we utilize a structural analysis when we do our work and avoid blaming individuals for their material conditions. Solidarity means we work alongside and learn from our community members. It is rooted in the assumption that the communities we work with know their needs, and the solutions to address those needs, better than an outside NGO possibly could. This ensures we’re not ‘parachuting in’ and causing harm. For us, solidarity is a reciprocal relationship in which people work together to challenge oppression through mutual respect and valuing of each others’ contributions towards common goals. A solidarity-based analysis looks at relationships of power to better understand pressing social issues. Casa - Pueblito understands that we do not lack the means to solve pressing social justice issues but rather that the powerful have a vested interest in maintaining the global status quo. We know it’s not random chance and the 1%’s hard work that saw 82 percent of global wealth generated last year go to one percent of the population while the bottom 50 percent saw no increase at all. We look forward to working in solidarity with you this year for a better world! We're excited to celebrate Yamari Martin-Halsall for her Award as one of five young leaders selected to be an OCIC Global Changemaker Youth Ambassador 2018. Yamari was a Casa-Pueblito Canada Summer Jobs employee in 2017 and her continued role as a volunteer for our organization and others is exceptional. We were proud to nominate her for this award, and now we're equally proud to share with you her insights to inspire more young leaders making the world better and brighter for all. Q: What does being a Youth Global Changemaker mean to you? Global Youth Changemaker is more than just a title, it's an idea. It’s the idea that someone who has so far been on this planet for a short time can make a difference on this planet. For me it also means collaborating with other like-minded individuals to find ways to positively impact the world we live in. Q: Why did you want to work at Casa Pueblito for a summer job? A: Last summer, as I was just completing my undergraduate degree, I realized that I now had the time to do things that I was actually interested in, instead of feeling forced to do them as a part of my academic requirements. Tania, a friend of mine who had previously worked for Casa, alerted me of a job posting for a summer events coordinator. Immediately before I event got through the job description I knew that I wanted to be at Casa – Pueblito, and it just so happened that I had the right qualifications. I had never worked with Casa – Pueblito before, having only gone to the 2016 summer social. But I knew that I wanted to do work that was meaningful not only for my resume, but also for my community. Up until then, I had been struggling to find paid work with an organization that worked in Central America, much less the country my family had roots in since pre-Columbian times. But what immediately attracted me to Casa was their commitment to solidarity, social justice and community building in Latin America and Latinx youth in Canada. I felt that not only could I grow from the experience working at Casa – Pueblito but that hopefully they could benefit from me as well. Q: How did you bring the spirit of a Changemaker to your role at Casa Pueblito? A: When I started at Casa – Pueblito, our team was pretty tiny, but mighty. I couldn’t have asked to work with more supportive, talented and strong women such as Sinéad and Olivia. I felt a bit of pressure not only as the only Nicaraguan working in the Toronto office but also as the only Latina (at Casa-Pueblito's Managua Office, 3 out of 4 staff are Nicaraguan; when I worked in the Toronto office there were 3 staff and 2 interns) . From the very first day I knew that I needed to speak my mind about issues that affected my community, and I am very grateful that Sinéad and Olivia and the rest of the Casa – Pueblito team helped foster an environment where that could happen. During that time I wanted encourage solidarity not only across borders but most importantly at the time, with Latinx youth. Having gone to the summer event from the year before, I already knew I wanted a change. To me, the work we were doing was meaningful not only because we were raising money for Casa’s projects, but also because it was giving a much-needed platform for marginalized and young Latinx individuals to share their experiences with others inside and outside of the community. Q: How have you been exploring and building as a Changemaker since then? A: Since then, I have been taking time not only to build my skills but also to continue decolonizing my perspective. The past summer was very eye opening for me, and I knew that I needed to keep checking in with myself and continuing that conversation. My time at Casa as an event coordinator was over, but I knew that I wanted to stay involved as much as possible. Thanks to Sinéad, I had the opportunity to engage in public speaking, something that up until then consisted mainly of speaking about dead Spanish literary figures and acting in a theatre production. One avenue I have really been exploring since then has been creating my own voice for change through poetry. I had been taking a course called Spoken word, culture and performance at York University, and it was there that I really felt inspired not only by my professor but also my classmates to push myself creatively and use my words as a tool for change, no matter who is listening. Q: How do you want to Change the world? A: Ultimately, I am a strong believer that the world cannot be changed by the efforts of one person alone. Looking towards the future, I hope that I can use my voice and privilege to incite people to want to contribute towards the change the world so desperately needs. My voice is only so small and quiet, but the voices of mine and many others is so much louder. Q: What's up next for projects you're excited about ? A: Thinking about sharing voices and changing the world, I am super excited about some future projects I have planned for this upcoming year, one of them in collaboration with the other Global Youth Changemakers and OCIC. We are planning an interactive Human Library of experiences and expertise where people can learn more about the Sustainable Development Goals. We are all strong advocates for collaboration and cooperation and we hope to bring together not only active members of the international development community but also those willing to learn more. So, stay tuned as we launch that event! 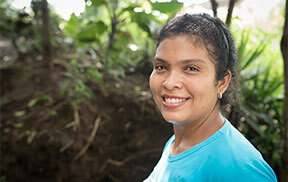 Casa - Pueblito takes our direction from the grassroots organizations we work with in Nicaragua. Supporting local organizations and communities as they work for justice and positive change locally in Nicaragua means that Casa - Pueblito does not presume community needs or prescribe project design. It means that we acknowledge the power imbalance inherent in Global North-South partnerships and try to make sure that when our partner communities tell us what they need from us, we listen and do our best to make it happen. Ernesto Sirolli talks about the importance of listening to communities. We do our best to listen to our community partners, with the understanding that the communities we work with know better than we possibly could what their local needs are, and we respect the numerous ongoing struggles for change and types of expertise that exist in the communities we work with. We work alongside communities every step of the way when it comes to project implementation, from community meetings, to collaborative monitoring and evaluation, and on-site visits. We do our absolute best to avoid (re)producing a colonial relationship with communities in Nicaragua. Most importantly, working from the grassroots means that building meaningful relationships with the people we work with is at the heart of all that we do. While all of this may seem obvious, international development institutions and NGOs have a bad track record not only when it comes to listening to and taking direction from the communities we work with, but when it comes to ensuring that we do no harm to those same communities. From the IMF’s and World Bank’s active participation in the promotion of neoliberal policies that decimated many countries and communities in the Global South, to the Canadian NGOs partnering with Canadian mining companies like Barrick Gold with a track record of horrendous human rights abuses, it is well-documented that international development organizations have a lot of harm to answer for. Casa - Pueblito understands that working for a better and more just world means acknowledging that international development organizations are complicit in upholding the systems of oppression that operate globally. As an organization dedicated to social justice and solidarity across borders, we are an explicitly anti-racist and feminist organization. Our community partners trust us because of our years of experience working in Nicaragua, and relationships that various coordinators and team members have worked to build. We recognize that we couldn't carry out any of the necessary work that we do without their support and dedication to improving their communities. Grassroots communities are on the front lines of th struggle for justice, and we are proud to take our direction from the grassroots organizations and communities we support. Happy New Year! As we start to prepare for 2018 here at Casa - Pueblito, we wanted to share with you the incredible work you made possible in 2017. With your support, we were able to support 7 community-led projects in Central America, specifically in Nicaragua, that positively impacted hundreds of community members. All our projects addressed locally - defined needs and were designed and implemented by our community partners themselves. Here are the 7 projects you made happen in 2017! In La Calera, we supported the community as they worked for water security. Together, we installed community water services that will provide, for the first time in the community’s history, immediate access to clean and safe water for 11 families. Before this project, community members had to walk to the nearest river for water for drinking, cooking, bathing and washing their clothes, a river which has increasingly been exposed to agro-chemicals and animal waste. Our 2017 project with Jiñocuao resulted in the construction of 44 latrines for 44 local families. This project directly benefitted 216 people: 61 children, 31 youth, and 124 adults. The families who received latrines are the most vulnerable members of Jiñocuao, as determined by a community self-assessment. Additionally, as part of the project, nurses and nursing students from the local community health centre were invited to the community to facilitate workshops on hygienic practices, disease prevention, and community health. This project built 8 community plantations for the production of plantains and bananas in order to provide basic food security to Santa Julia community members. This project addressed an urgent local need for food security as Santa Julia has experienced food shortages and poor agricultural production in the last few years due to droughts linked to climate change. 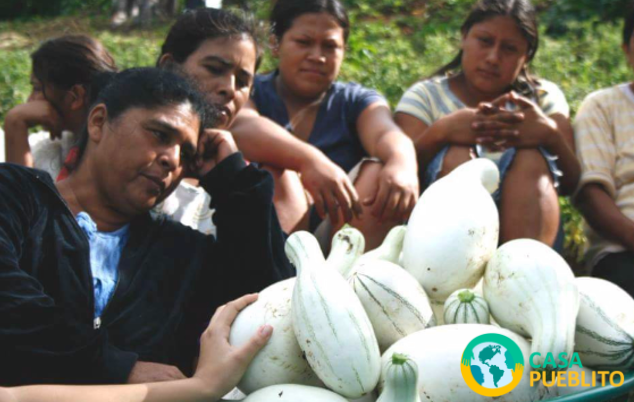 Plantations were established in the homes of eight women, all members of the Gloria Quintanilla Cooperative, this project's implementing partner. Each member received 157 plantain plants and 158 bananas plants. Plantains and all their varieties are a good alternative crop in dry areas like Santa Julia as they require less water compared to other plants. Produce from the plantations will be divided amongst the families of the community, and the local children’s eatery "Cherished Children". The community eatery will receive 40% of the total produce to contribute to providing a weekly free lunch for food insecure local children. A further 20% will be for the families’ self-consumption and 35% will be sold in local vegetable markets to generate income for participating families. This project provided visual arts, music, and dance classes to youth and children in San Ramon, Matagalpa, as a way of promoting ancestral knowledge and cultural expression, strengthening the self-esteem and cultural identity of the residents of San Ramon. The project directly benefited 120 children, youth, and adults. The project provided artistic materials for the arts classes, and facilitated courses and training for participants in visual arts techniques. As part of the project, students in the art classes were involved in the elaboration of an artistic mural called "Indigenous Archers of Yucul", in homage to the indigenous archers of Yucul from the area of Matagalpa who participated in the Battle of San Jacinto on September 14, 1856. Additionally, the project funded a series of folkloric dance and traditional music classes with children, youth, and adults in order to recuperate indigenous knowledge and customs of the municipality. Through a variety of workshops, courses, excursions, and other healthy activities, our 2017 project with Podcasts for Peace promoted education, gender equity and economic capacitation workshops for local seniors. Located in a low-resource neighbourhood a few blocks from the municipal dump in Managua, Nicaragua, Podcasts for Peace is a social justice community center that helps young adults become activists and leaders as they enrich the lives of children across three focus areas: Creative Expression, Literacy and Life Skills and Health and Wellness. Our 2017 project, also improved the infrastructure of their cultural center where all programming is hosted. The project focused on three local groups in vulnerable situations: seniors, women, and at-risk youth. Specifically, our 2017 project with Podcasts for Peace promoted gender equity by engaging young men and women in gender-related workshops and support groups, developed local economic self-sufficiency by engaging the elderly in occupational training, and improved the infrastructural capacities of the center, including improvements to the electrical system, re-making the floor, re-installing a kitchen and washroom, and acquiring work tables. This project improved the infrastructure of the agricultural area in the "Los Cachorros" farm, a shelter that houses at-risk boys and young men who are involved in the Los Quinchos program. The other part of the project saw the children and youth of Los Quinchos participate in workshops and training about the importance of environmental protection during environmental crisis and agricultural production. Children and youth attending Los Quinchos were trained in soil management, creating organic compost and fertilizer, proper planting techniques, and proper farm animal management. Through these activities, participants received vocational skills and training that will assist them in their future professional and vocational endeavours. For ten years, the El Triunfo Education Project has provided an affordable middle school education to indigenous Mayan children in the community of El Triunfo in the mountains of Solola, Guatemala. Classes from grades seven to nine are offered. The most recent school year began in January 2017 with sixty students enrolled in the school. From 2011 to 2016 classes at the high school level were also offered. Scholarships are also available to students enrolled in high school and university program. In 2017, we supported the school! We can't wait to share our 2018 projects with you. Thank you for working for social justice and solidarity across borders with us! Every day for the past 27 years, women in the community walked to the river and brought water back for drinking, cooking and bathing. It prevented them from reaching their full potential. In 2017, Ashley Rerrie, as Country Director at Casa - Pueblito, worked to support community members working to change these people’s - and especially women’s - lives forever. Board Spotlight: "Casa - Pueblito Values Participation"
The best thing about being involved with Casa Pueblito is being part of a group of sincere and committed people who see development as a partnership with local leaders and communities in Nicaragua. Casa - Pueblito values participation - the participation of communities in their own development, and the participation of donors and volunteers, board members and student groups, in a project of solidarity with the Nicaraguan people. It has both the benefits and challenges of a small organisation that relies heavily on its community of supporters to drive and resource the work. My most memorable moment from my trip to Nicaragua actually came a few years after the trip. One my teachers, Mrs. Gomes had gone back to the same community we had been to on our first trip and my host family sent back a letter for me. It was such a surprise - I couldn’t believe that they remembered me, and it meant so much to hear from them. I still have that letter. The lessons I’ve learned from my time in Nicaragua weren’t instantaneous. In fact, the impact of that trip has revealed itself in different ways over the years. Those ten days have shaped my politics, my travels, and who I’ve become personally. I remember Mr. Heffernan handing out a sheet on Nicaraguan politics and history during one of our preparation sessions. I was overwhelmed by the information because it touched on something I was only starting to realise was important to me: inequities that exist in our society at home or on a global scale. I was 15 and had a vague sense of injustice, but Nicaragua is what made it real. I learned about corruption and poverty, but also community building, solidarity, and resistance. I wound up majoring in Political Science and I’m happy to be part of the Latinx community in Toronto. I’ve had many more experiences since then that have deepened my interest in politics and my commitment to equity, but it did all grow from that initial spark of interest in a handout and Mr. Heffernan’s stories. Another way Nicaragua has impacted me is in my pursuit of seeing and travelling around the world as much as I can. I haven’t really stopped moving since Nicaragua, and while I have never gone on another social justice project, it’s interesting to reflect on how I usually seek out work while I’m traveling so I can spend more time in each city or country I visit. I think that comes from what I learned in Nicaragua, which is that getting to genuinely know the community and region you’re travelling to is so important. Meet locals and stray from the typical tourist spots as often as you can. I think what is important in our world today is to support opportunities for us to grow as more compassionate beings with an openness and understanding that extends to people in different communities across the globe. Finally, I know that going to Nicaragua has shaped how I’ve grown as a person. I have a dear friend who coordinated social justice projects for post-secondary students, and I challenged him on the value of these trips. My friend agreed that many of the students who take these will return to Canada and live the same lives as they’ve always had. But he challenged back: does that matter? Even if you’re not suddenly woke, even if you go back and never involve yourself again in social justice projects again, you can’t erase the experience of working with others, meeting new people and challenging yourself in every way possible to see things in a way so different from your daily life. That stays with you. These trips are important because they dismantle fears and stereotypes. It encourages us to listen, to be patient, to observe and to be unafraid. It creates friendships across borders, across cultures, across faiths. Given the chance, I would absolutely participate in the experience again. Also, as a secondary teacher with the Dufferin-Peel Catholic School Board, I know I may have the opportunity to visit Nicaragua in a different role. I would love to go back to Nicaragua as an educator and be able share this experience with a new set of students, colleagues and local community members. While I admit, I’m still working on listening more and putting fear aside, our trip to Nicaragua has made me a more open person and that is the greatest impact the trip has had on me. These trips make a difference. To the communities you visit. To the people you work with. To you. Having been transformed in my general outlook on life during 3 years of brigades in Nicaragua in the 1980', I felt a void in that life with the collapse of the solidarity movement in Canada following the electoral defeat of the Sandinistas in 1990. The creation of Casa Canadiense in 1992 opened the door to re-connect with the people of Nicaragua and with like-minded folks in Canada. My first visit to the Casa in Managua in 1996 was inspiring and my subsequent travels to areas of Nicaragua I had worked and lived in years earlier showed the ravaging effects of the return of right-wing government focused only on the rich. Whereas in the 80's shelves were bare due to the devastating economic embargo inflicted upon the people by the U.S. government, now stores popped up selling anything and everything. The catch, you needed money or credit. The expats returning from Miami had that. But, looking behind the facade of progress, the have-nots had nothing. This reinforced my belief in maintaining solidarity with those who had cast out a ruthless dictatorship, staved off the most powerful country on the planet – all the while expanding literacy, access to healthcare and land reform on a Gross Domestic Product equivalent to the annual budget of the Metropolitan Toronto Police force. I continue to be inspired and uplifted by the amazing people of Nicaragua. While sitting next to a Nicaraguan businessman on a flight from Atlanta to Managua recently, he commented on how he regularly sees foreigners on this flight coming to Nicaragua to help his people. I replied, "Well, I'm not one of them." He was perplexed. I explained that I come to learn from his people. What I do is but a paltry tuition for the life's lessons I have gleaned over the past 30 years. Being in the company of inspiring individuals and communities both in Canada and Nicaragua. Teacher Spotlight: "The whole school benefits from the Global Education Program"
The Global Education program run by Casa - Pueblito is amazing! I have looked at other programs that other schools go on and I don’t see anything better out there. These kids change when they go on this trip. Some of it sticks and some of it will come back to them as they mature and grow. The whole school benefits from the experiences the few go on, because they come back and share. Our community and our world benefit because ultimately these students find their niche and take up a cause and make the world a better place! I think my trips to Nicaragua, especially the first one, made me want to be a more conscious person about the world. Those experiences have impacted the choices I make on a daily basis. Board Spotlight: "Casa - Pueblito's got courage to fight the good fight"
My family has long roots with Casa - Pueblito – back in the day, my aunt was part of Trucks to Nicaragua, a precursor to Casa. My understanding is my dad even wrote the song that plays in the movie. Anywho, when I was in second year university I was looking for an internship/adventure for the summer and my family connected me to Casa. Casa was awesome enough to help me organize a couple internships in Leon for two months, so off I went in the summer on my first truly solo trip at 19 and with little Spanish. Teacher Spotlight: "My experiences in Nicaragua have made me a stronger teacher." I have chosen to work with Casa – Pueblito due to their rich history of working in Nicaragua and close ties to the Dufferin-Peel Catholic District School Board (DPCDSB). Casa – Pueblito facilitates excursions to Nicaragua for many different high school groups in the DPCDSB, as well as other school, college, and university groups. They hire exceptional leaders with a great passion for education and for social justice. I have been pleased with my previous 7 experiences with them and look forward to working with them again in the future. I still remember most of my experience in Nicaragua. From staying at Casa and working on the school, it is amazing what I still remember after 5 years. A particular memory that I am extremely fond of is of our first night staying with our families. I remember sitting down with them and talking with them. Since we were unsure of what to expect of our families, we had some questions prepared to ask them as conversation starters. To my surprise, we did not have to use them at all. We shared stories about our lives in Canada and they shared their stories about their life in Nicaragua. It was a chance for me to see how much we had in common even when we lived so far away.